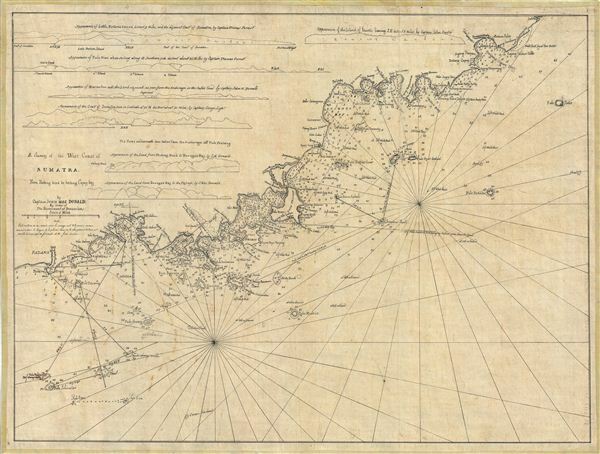 A Survey of the West Coast of Sumatra From Padang head to batang Capay Bay. A remarkable discovery, this is a c. 1820 manuscript map of the western coasts of Sumatra (Indonesia) around the city of Pedang by Scottish sea captain John MacDonald. The map covers the west central Sumatra coastline from, roughly, Pedang (regional trading center) in the north to the town of Painan in the south. MacDonald surveyed this coast by order of the 'Government of Bencoolen.' Bencoolen (Benkulen, Bangkahulu, Bengkulu¬) was a short lived colony of the British east India Company situated on the west coast of Sumatra. The colony was founded in 1685 in an attempt to disrupt Dutch hegemony over the lucrative Sumatra pepper trade. In 1714 they built Fort Marlborough which they maintained until the Anglo-Dutch treaty of 1824 which ceded full control of Sumatra to the Dutch in exchange for Malacca, Singapore, and Malay. MacDonald was first active in this region from about 1784 (when he married Nancy Scott Bogle, a widow and the daughter of an east India Company functionary) to 1800, when he returned to england. In 1808 tenuous records suggest that MacDonald was again assigned to Bencoolen, this time as the colony's Chief engineer at Fort Marlborough. The present chart appears to be a manuscript copy of some of MacDonald's early unpublished surveys of the region. We surmise that MacDonald most likely produced this chart during his tenure as Chief engineer, between 1808 and 1818. The document seems to have been traced in pencil on fine translucent onion skin paper (common to the early 1800s) then inked over. Several minor elements in a different hand, some in French, further suggest updates to c. 1820. The seven land profile views present in the upper left quadrant reference MacDonald himself, Captain Thomas Forrest who visited Sumatra in 1774, and Captain John Hunter, eventual governor of New South Wales. The whole is beautifully produced and striking for its remarkable detail. A manuscript version of this chart must have eventually found its way to London, where John Norie published it as an inset in his larger map entitled The Whole of the West Coast of Sumatra. John MacDonald (1759 - 1831) was a British naval officer active in the late 18th and early 19th centuries. John was the son of Flora MacDonald, a Jacobite heroine who sheltered the young Bonnie Prince Charles, the second Jacobite pretender to the throne of the British Isles. MacDonald entered the service of the British East India Company where he was commissioned as a captain in the Crops of Engineer, Bengal. By 1784 he has been assigned to British East India company trading post at Fort Marlborough, Bencoolen, Sumatra. There he married the widow Nancy Scott Bogle. He spent approximately sixteen years in Bencoolen wherein he surveyed much of the western coast of the island. He sent several missives to the Royal Society featuring observation on magnetic variations based on studies done at Bencoolen and St. Helena from 1794 - 1796. Back in England, c. 1800, he was elected a fellow of the Royal Society and elevated to Lieutenant-Colonel of the Royal Clan-Alpin regiment. Subsequently he was stationed in Ireland where he composed several volumes on military strategy. MacDonald seems to have returned to Bencoolen by 1808 when he was assigned to the post of Chief Engineer at Fort Marlborough. In 1818 or 1819 he returned to England settling in Exeter, where lived for twelve years until his death in 1831, he was 72. He is buried at Exeter Cathedral. Very good condition. Backed on fine linen.